Overcoming Fear – Teacher's PETS Inc.
We all have grand dreams and plans for our lives. We all have different definitions of failure, simply because we all have different benchmarks, values, and belief systems. A failure to one person might simply be a great learning experience for someone else. Do not let your goals and dreams fall by the wayside. All successful people have experienced problems at some point in their life. The first step in achieving your goals is that you have to really want to achieve the goal. If you cannot picture yourself achieving a goal, chances are, you won’t. People who have made it understand that setbacks are a necessity for growth. Setbacks are not the same as failures. How you handle setbacks determines a large part of whether or not you end up successful. You cannot always be ready for what life throws your way, but how you react to different situations is entirely up to you. We all know success doesn’t come overnight. You must be persistent. It might take time, but it will ultimately pay off. Always finish what you start. Starting a new project is good; finishing it is better. Do not get into a cycle of starting new things and leaving them unfinished. Remember to congratulate yourself on your small successes along the way because it helps you stay motivated by recognizing your successes. Start by setting a few small goals. These should be goals that are slightly, but not overwhelmingly, challenging. Think of these goals as “early wins” that are designed to help boost your confidence. Taking one small step at a time will help build your confidence, keep you moving forward, and prevent you from getting overwhelmed with visions of your final goal. Guess what? 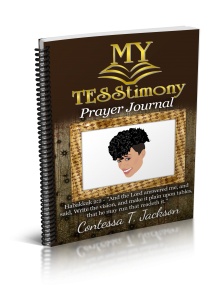 You can write your daily goals in the My TESStimony prayer journal/notebook :). Purchase one today!